You can test wastegate control vacuum by attaching a regulated pressure supply to the wastegate actuator hose connector and using a vacuum gauge to read the actuation pressure. The actuator should begin to open at approximately 7.2-8.7 psi (50-60 kPa). Check all associated hoses for damage or loose connections. Subaru Turbocharger Explained: You can check the operation of the wastegate actuator using a vacuum gauge. The “Achilles heel” of turbochargers is the turbine shaft. Although made to precision specifications and using the finest materials, these shafts can fail due to the high rpm at which they spin and are vulnerable to lack of lubrication, debris and the quick spin-up rates that occur under high boost. 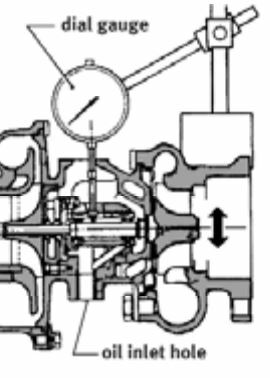 To measure the axial movement of the turbine shaft, position a dial indicator gauge against the end of the shaft at the turbine end, and push against the compressor end of the shaft. Axial play should not exceed .003 in. (0.09mm). Subaru Turbocharger Explained: Measuring axial play. To measure radial movement of the turbine shaft, place the dial gauge through the oil outlet hole and against the shaft. Rotate the turbine shaft and observe any fluctuations. Jiggle the shaft up and down, and back and forth, while observing the dial gauge. Radial play should not exceed .006 in. (0.17mm).